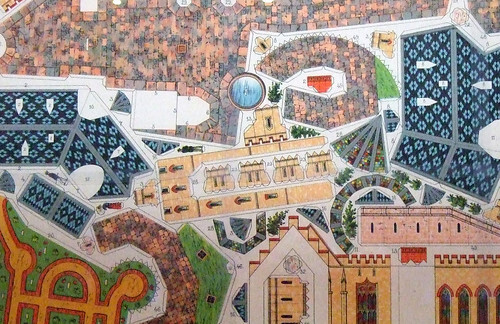 The Pompe à Chats is one of a series of paper construction kits published by Pellerin in France in the 1880s and 90s. 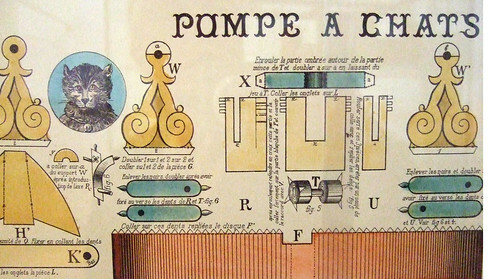 Most are unambiguously instructive, but this – well, the display offers no clues, although the prosaic explanation would be that it’s a cats’ pump, a French pedagogical device to persuade the young that engineering can be fun, and no more fanciful than a teddy-bears’ picnic. Top: Stonehenge reconstructed, in the version designed by Brian and Lizzie Sanders for English Heritage, UK, 2001. Above: Pompe à Chats (Grandes Constructions Mécaniques No. 521), published by Pellerin, France, 1880–1900. 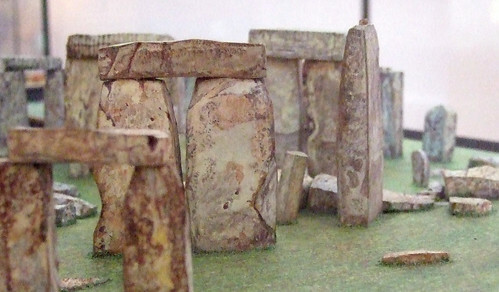 To design a cardboard Stonehenge, with never a straight line, might also seem a little unhinged. But Brian and Lizzie Sanders did it a few years ago, for English Heritage, and a resolute pair of constructors then proved that it works (top and below). 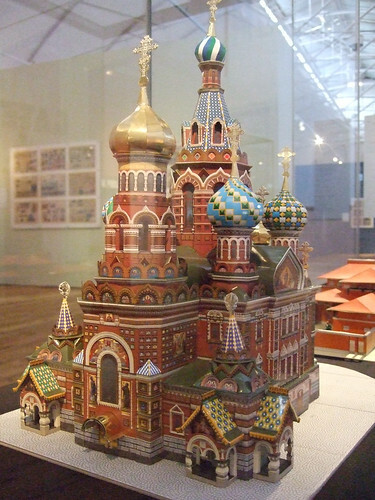 Mass-produced paper architectural models followed the arrival of colour lithography in the early nineteenth century, and never went out of fashion. ‘Cut It, Fold It’ displays an astonishing array of tiny buildings collected by Robert Freidus, a New Yorker who owns more than 20,000 of them. Some are aimed at children, some are monumental undertakings probably better suited to lighthouse keepers. Above: Frank Lloyd Wright’s Robie House, Chicago. Victor Velthuijzen van Zanten, Holland, 1989. Flat or solid? For many of us the idea of constructing 3D model buildings and then flying through them in the imagination has had an enduring appeal. Collectors, however, keep their models flat, and that can be just as seductive. One or two of the sheets here, covered with wildly intercut patterns and colours and shapes (not crazy at all but entirely practical), seem to echo the flat verve of kabuki actor prints. As it happens the earliest architectural paper models were produced in Japan, in the sixteenth century, although none are in this show. Above: Schloss Hohenzollern (1910-20), published by Schreiber, Germany. 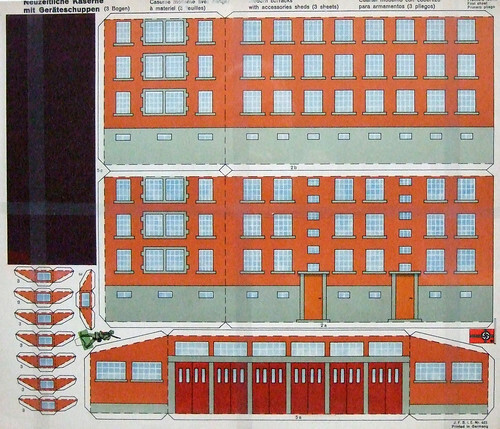 Below: Nazi army barracks (1930s), Schreiber, Germany. Transformations from flat to solid, solid to flat, have been the ingenious work of modellers, globe-mappers from Mercator onwards, cardboard Stonehenge designers – as well as the makers of two-dimensional art. We can fly through digitally now, so that leaves just the art, once the age of paper and ink is over. Another damned elegy, then. Above: Church of the Saviour on Spilled Blood, St Petersburg. Umbum, Russia, 2008. 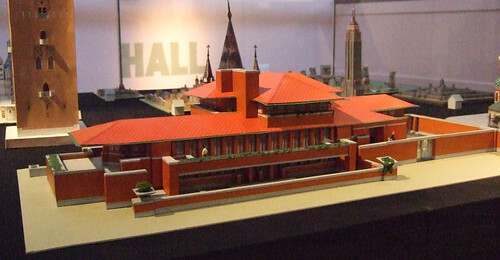 ‘Cut It, Fold It: Build It with Paper’ runs until 9 January 2011 at the V&A Museum of Childhood, Cambridge Heath Road, London E2. Eye magazine is available from all good design bookshops and at the online Eye shop, where you can order subscriptions, single issues and back issues. The Autumn issue, Eye 77, is on its way to subscribers worldwide – see Eye Before You Buy on Issuu for a taste of its contents.